Pickle Pie Event Sign up to make 5 cute projects on your embroidery machine - 2 day event ie Saturday and day 2 you can come either Sunday or Monday. Please let Helen know on Saturday which 2nd class you will be attending. Class fee includes a lunch each day, trunk show of Pickle Pie projects, and all fabrics to make the projects as well as a Pickle Pie tote. Dates Aug 18 and 19th or alternate Aig 20th. Aug 21 10:00 - 5:00 Haunted House Wall hanging on the embroidery machine with Helen. Aug 23 If second session on the T-shirt class is desired. 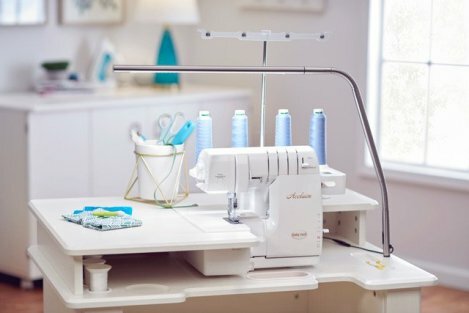 This is the new Acclaim 4 thread serger. 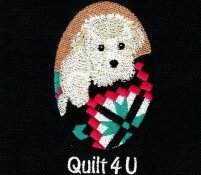 Coming to Quilt 4U soon!